Say ‘hello’ to your new favorite buttercream recipe! My easy recipe for French buttercream is silky smooth, luscious, flavorful and it holds its shape perfectly! 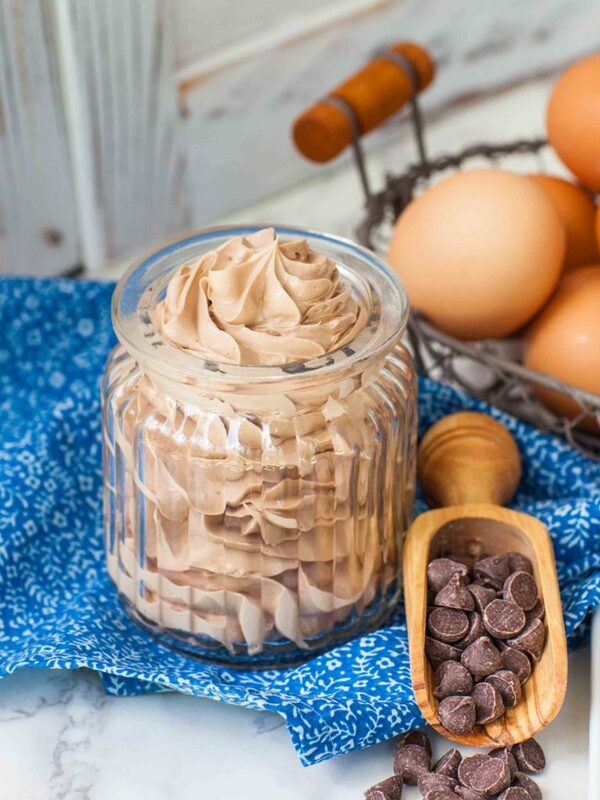 It’s a less-sweet and more smooth alternative than my regular chocolate buttercream. 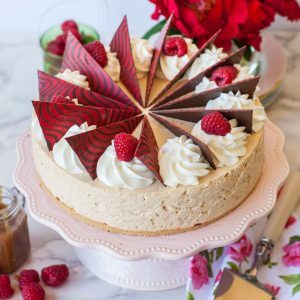 If you’ve never tried making and using this version of buttercream before, you’re in for a real treat! 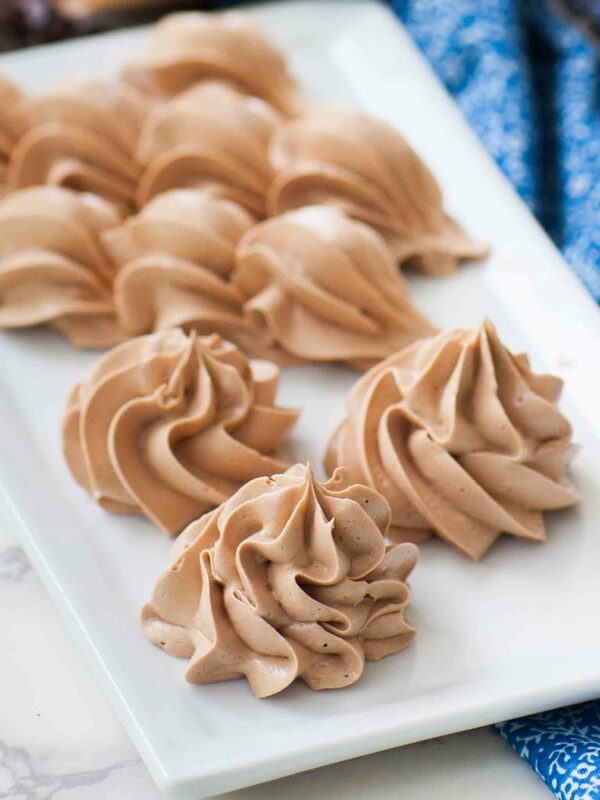 This frosting recipe is great for cakes, cupcakes and any other dessert. One batch of this frosting will work for 24 cupcakes or a two layer, 8-inch cake. Watch my video recipe for step-by-step details on how to make French buttercream! Want new recipe notifications? Make sure to subscribe to my YouTube channel! So what makes French buttercream so great? The method of preparation is quite different that any other frosting! It’s still made with butter but instead of confectioner’s sugar, it’s made with egg yolks, sugar syrup and butter. The egg yolks are whisked until pale, then super hot sugar syrup is added slowly, cooking the egg yolks and creating a thick custard. The butter is added gradually in small amounts, until a fluffy and smooth buttercream forms. The egg yolks are fully cooked by the hot sugar syrup so no need to worry about raw yolks! The yolks add incredible flavor to the frosting, one you don’t get with other recipes. The beauty of this recipe is you can create an endless variety of flavors! For this video recipe, I created a coffee-chocolate version for my ‘Chocolate Coffee Cake’ (also from the cookbook! ), using melted chocolate and coffee emulsion. This recipe will work great with white chocolate or simply add any type of flavoring such as caramel/dulce de leche, vanilla, lavender oil or even strawberry emulsion! You can even add a few tablespoons of berry preserves for a berry flavor. I recommend adding any flavor at the end of the recipe, once the buttercream is ready. For my video recipe and in my cookbook, I used this chocolate buttercream for my ‘Chocolate Coffee Cake’. This moist and rich chocolate cake is filled with a creamy coffee custard and frosted with a coffee-flavored chocolate frosting. 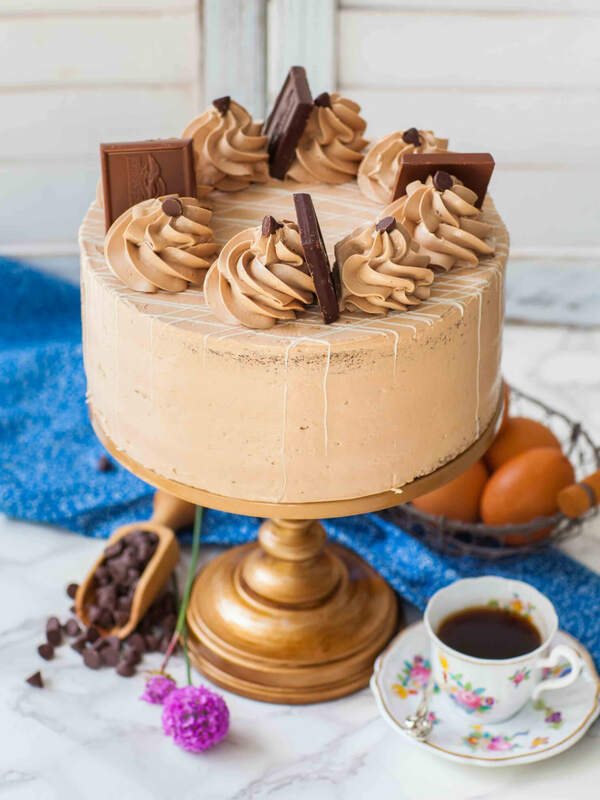 If you love coffee and chocolate, you’re going to love this cake recipe! 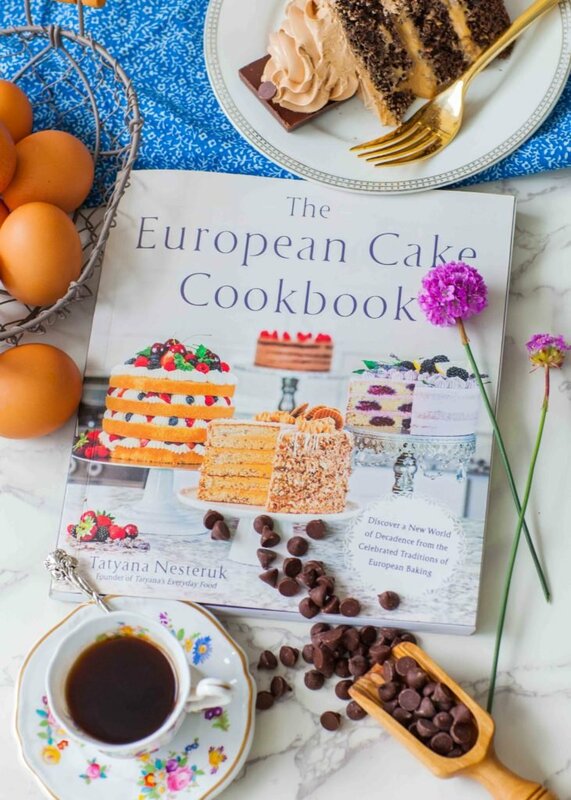 This recipe is from my newly released book, ‘The European Cake Cookbook’. You’ll find this recipe used throughout my cookbook and on my blog! Make sure to get a copy of my new cookbook here! It’s available online on amazon.com and also in-stores, like Barnes&Noble! This cookbook contains 65, all-new cake recipes that are perfect for any occasion! 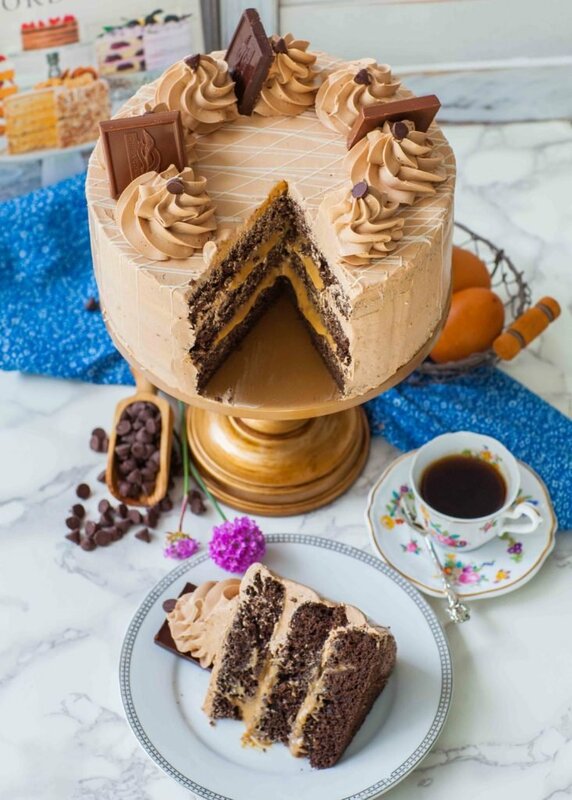 My ‘Chocolate Coffee Cake’ is made with chocolate cake layers and a coffee-flavored custard. Watch these video recipes for more instructions. And if you want a more detailed video for my ‘Vanilla Pastry Cream’, you can watch it here! Get a candy thermometer to make sure the sugar syrup reaches the right temp. I love my classic KitchenAid stand mixer – a must in every kitchen! Use these jumbo cake decorating tips to garnish any cake. And this Ateco cake turntable makes cake decorating a breeze. For French Buttercream: place the egg yolks into a stand mixer bowl and whisk on medium-high speed for a few minutes until thick and pale. Meanwhile, combine the water and sugar in small saucepan. Heat the sugar, not stirring, over medium-high heat until the temperature reaches 238F/115C, about 5 minutes. Keep the mixer running on medium speed and pour the hot syrup in a slow and steady stream into the egg yolks. Once all the sugar syrup has been added, turn the mixer up to high speed and whisk for 5 to 7 minutes, until mixture is thick and pale in color. It also needs to be just lukewarm to touch. Begin adding the butter, 1 to 2 tablespoons at a time, mixing for about 15 to 20 seconds after each addition. Scrape down the sides of the mixing bowl often to get all the butter mixed in well. The buttercream will start to thicken as more butter is added. After adding the butter, add the melted chocolate, salt and coffee extract. Mix again for a few minutes until a uniform and fluffy frosting forms. For Chocolate Cake: preheat oven to 350F/177C. Line three, 8-inch (20-cm) baking pans with parchment paper and spray the sides with a baking spray. In a large mixing bowl, cream together the softened butter, sugar and vanilla for a few minutes, until fluffy. Then add in the eggs one at a time, mixing well after each addition. Dissolve the instant coffee in the warm milk, then add to the batter. In a separate bowl, combine all the dry ingredients: flour, cocoa powder, salt and baking powder. Mix together, then sift into the cake batter to get rid of any clumps. Using a hand whisk, mix the flour into the batter just until combined. Be careful not to over-mix the batter! Divide the batter evenly between the three prepared pans. Bake in preheated oven for 25 to 28 minutes, until a toothpick inserted into the center comes out clean. Remove from the oven and cool completely before assembling cake. For Coffee Custard: In a medium-sized mixing bowl, whisk together the egg yolk, sugar, cornstarch and water for 2 to 3 minutes, until the mixture is smooth; set aside. Combine the instant coffee, milk and flour in a medium-sized saucepan. Cook the milk, whisking constantly, until the milk is steaming hot but not boiling. Temper the hot milk into the egg yolk mixture, adding it slowly and whisking. Once the two mixtures are combined, pour the custard base into the saucepan. Cook over medium-low heat for 4 to 6 minutes, stirring constantly with a rubber spatula, until the mixture thickens into a custard and holds its shape on the back of the spatula. Whisk the custard vigorously to get rid of any clumps. Remove the custard from heat and add the coffee liqueur and butter. Whisk until the butter is completely melted. Cover the custard with plastic wrap and place into the refrigerator to cool completely. To assemble the cake, first cool the cake layers and custard completely. Prepare the buttercream while waiting. Transfer half of the buttercream into a pastry bag tipped with a star tip; I used Ateco tip no 847. For each layer, first pipe a barrier ring of the frosting around the edge, then fill the center with the coffee custard. Frost the top and sides of the cake with the remaining frosting. Add dollops of frosting on top and garnish with chocolate pieces. Keep cake refrigerated. Remove the cake from the fridge a few hours before serving, allowing the cake to thaw and warm up. Hello, I have your cookbook, which I love, and will attempt to make the coffee chocolate cake with custard and buttercream. Do you think this cake is sturdy enough to be covered in fondant? I’m afraid the custard will leak under the weight of the fondant. Thanks for any insight you might have. Thank you! Is it possible to cover this cake with fondant?